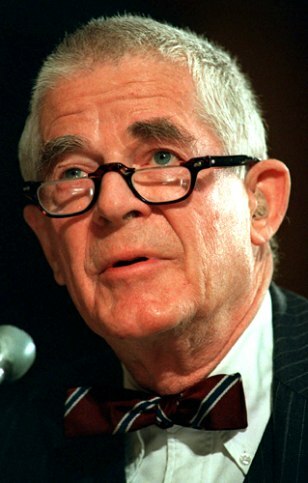 The first special prosecutor in the Watergate affair, Archibald Cox had a long career in law and politics. He served as Solicitor General for President John F. Kennedy in the early 1960s, and then returned to teaching at Harvard Law School. As the Watergate scandal grew in May 1973, Attorney General Elliott Richardson appointed Cox as an independent counsel to investigate. With revelations that President Nixon had taped many phone calls and conversations in the White House, Cox subpoenaed the key tapes. Citing executive privilege, Nixon refused to comply with the subpoenas and, on Oct. 20, 1973, ordered Richardson to fire Cox. Both Richardson and his top deputy, William D. Ruckelshaus resigned their posts rather than carry out the order. Solicitor General Robert H. Bork finally complied with Nixon's wishes. The firing of Cox and the resignations of Richardson and Ruckelshaus became known as "the Saturday Night Massacre." After Watergate, Cox returned to Harvard Law School, then, from 1980 to 1992, was president of Common Cause, an advocacy group that lobbies for campaign finance reform and ethics laws. He joined the legal team that defended the constitutionality of the 1974 campaign finance laws and later became chairman emeritus of Common Cause. On occasion, he argued cases before the Supreme Court. In a New York Times op-ed piece in 1996, Cox criticized what he described as overuse of independent counsel and special prosecutor activities. Former president Bill Clinton awarded the Presidential Citizens Medal for exemplary service to Cox in 2001, an award established, ironically, by Nixon, in 1969. 91 results searching for (creator_facet:"Cox, Archibald") in Law Journal Library. , sorted by "Number of Times Cited by Articles"